Rosen Shingle Creek resort revels in the fact it sits alongside historic Shingle Creek, the headwaters of the famed Florida Everglades. As it turns out, the AAA Four Diamond destination also happens to be at the headwaters of some world-class golf. 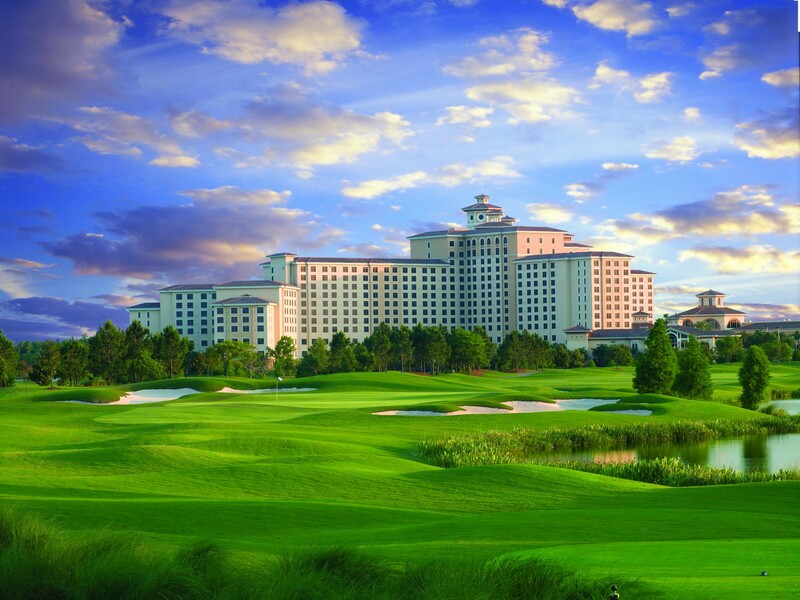 Nestled next to its namesake tributary, top-rated Shingle Creek Golf Club is one of the main reasons the luxury resort is a true oasis in the heart of Orlando’s congested tourist and convention-center corridor. This year, there’s even more reason to revel in Rosen Shingle Creek with the recent opening of the newly created golf course by Arnold Palmer Design Company. For decades, the late Arnold Palmer and noted hotelier Harris Rosen reshaped their respective industries. Along the way, the two Orlando residents also literally changed the Central Florida landscape. Palmer, of course, put Orlando on the map with his personal Bay Hill Club & Lodge, which annually hosts the prestigious PGA Tour Arnold Palmer Invitational and benefits Orlando Health’s Winnie Palmer Hospital for Women & Babies named after his late wife. Meanwhile, Rosen created one of one of the biggest and most respected independent hotel networks in the world’s most visited city and helped establish University of Central Florida’s renowned Rosen College of Hospitality Management after making an $18.2 million donation. Fittingly, Rosen and Palmer are now associated with the new Shingle Creek course, further accentuating an already-strong connection between the Orlando icons and their respective signature properties. For starters, the golf and hospitality icons nearly shared the same birthday (Rosen was born on Sept. 9; Palmer, 10 years his senior, passed away last Sept. 25 – 15 days after his 87th birthday. Indeed, there are a number of other parallels between Palmer and Rosen’s new championship course, situated just a few miles from Palmer’s former part-time home at Bay Hill. For instance, Shingle Creek’s longtime director of golf Dave Scott started his career working for Palmer at Bay Hill. And acclaimed golf instructor Brad Brewer, who opened his namesake academy at Shingle Creek soon after it first opened 13 years ago, was a longtime Palmer associate as the co-founder of the Arnold Palmer Golf Academies. Scott, who opened the former Shingle Creek course designed by the late Dave Harman, another former Palmer golf prodigy and one-time neighbor of Rosen, can’t wait to start showing off the resort’s new Palmer Signature course. To be sure, the course will be unlike anything before. For instance, Palmer’s senior golf course architect Thad Layton designed three totally new holes on a new 25-acre parcel of land owned by Rosen on the northern end of the resort, recreated numerous other holes to accommodate a future resort expansion with a new luxury tower, and updated Shingle Creek’s aging course greens and infrastructure while maintaining the property’s eco-conscious landscape mosaic. Some of the most noticeable changes made to the course were changing Shingle Creek’s traditional green complexes formerly protected by bunkers and thick rough on the perimeter of the holes. Now, the new Palmer layout features green complexes that have fairway-cut surrounds or runoff areas, giving golfers of all levels more forgiveness and strategic options. According to Layton, his team’s philosophy was putting strategy and variety at the center of the golf experience with design features that “harken back to the golden age of golf course design.” In other words, Shingle Creek golfers will now notice elevated greens (featured on the opening hole) or newly designed cross bunkers strategically placed in the middle of fairways like the pot bunkers on the par-5, 567-yard second hole, drivable par-4, 375-yard No. 10 hole and brand new No. 14 hole, an exciting 307-yard reachable par-4 that wraps around a newly created lake. The latter hole is followed up by a newly designed 151-yard, par-3, which is now the shortest par-3 hole on the course, but by no means the easiest. That’s because a challenging much smaller green now awaits golfers, precariously positioned and pitched towards the adjacent wetland that slopes into the new lake. This is also where Brewer’s golf academy studio showcases some exciting new features at the back of the resort’s driving range. Perhaps the biggest change is the greatly enhanced short-game practice area that will double in size Brewer’s previous putting, chipping and bunker areas adjacent to the academy’s private driving area. Brewer also integrated some new state-of-the-art swing analysis and game improvement technology at his indoor hitting bays. For Shingle Creek golfers looking to further hone their short games, a huge new putting green was built between the 7th and 8th holes, including never-before chipping and bunker areas. This new “break” in the course routing is also where Scott’s staff has a valuable new 2,000-square-foot event building to host special events and parties, further improving the Shingle Creek golf experience. Then, for one of the more memorable challenges at the new layout, the par-5 8th hole (formerly the playing corridor for holes 10-11) now stretches to PGA Tour-length 606 yards from the back tees. This type of variety is yet another reason Scott and the Palmer Design team are so excited about the new-look Shingle Creek Golf Club. Another way to put it is Shingle Creek is now a far cry from the banal “resort golf” marketing term that has become synonymous for that predictably ordinary golf course experience associated with so many resorts these days. In other words, play one resort and you’ve played them all. 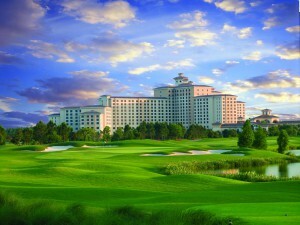 In the end, Rosen Shingle Creek guests got a course that even the King of Golf would be proud to play and call home.